We have a Belgian style waffle maker with a non-stick surface that makes the best waffles. I have seen smaller waffle makers so the amount of batter per waffle would have to adjusted to accommodate your waffle maker. 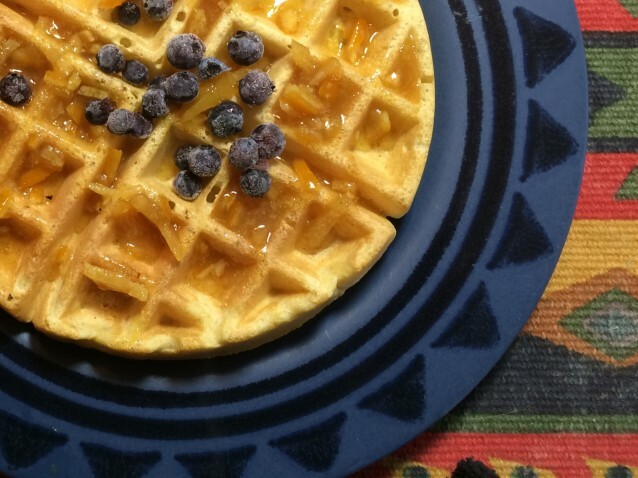 We like these waffles because they have a bit of a crunch due to the cornmeal. I always try to include a variety of flours but this recipe would work equally as well with all purpose flour. The last time we made these waffles we had lemon zest in the fridge so we added it to the mix and then thinned down some marmalade instead of maple syrup. Combine the dry ingredients in a bowl and stir to combine. Separate eggs placing the yolks in a small bowl and the whites into the bowl of a stand mixer. Beat the whites to soft peaks. Remove to another small bowl. Put the yolks in the bowl of the stand mixer adding the milk and oil. Mix to combine. Add the dry ingredients to the egg yolk mixture and mix to combine. Using a large hand held whisk fold the egg whites into the waffle mixture by lifting the batter through the egg whites. You can also use the traditional folding method with a spatula or wooden spoon. The idea is to preserve as much of the fluff of the egg whites as possible. Spread 3/4 cup in hot waffle maker and close lid for 2 minutes. Remove to plate and repeat.